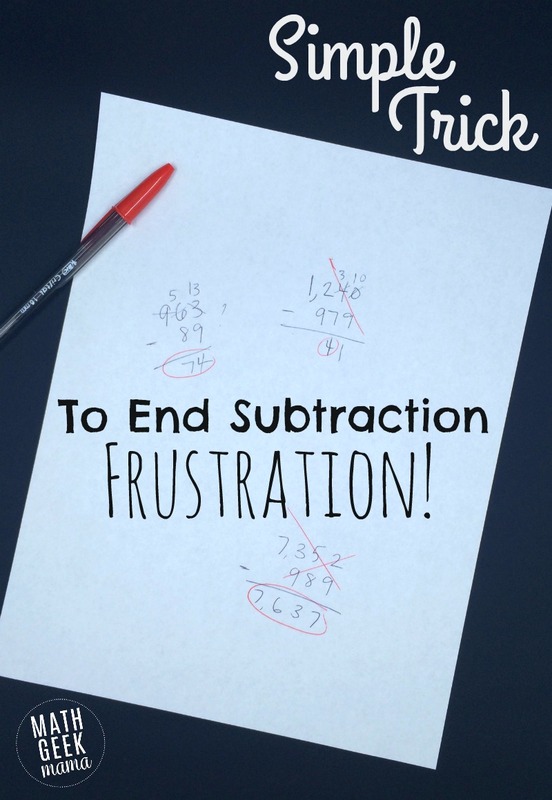 Simple Trick to End the Frustration With Subtraction! One math concept that often stumps students is subtracting with borrowing (or regrouping-whatever you’d like to call it). There are lots of concrete and hands-on ways to teach this concept so that it makes sense to kids, rather than expecting them to memorize a procedure. In the past, I have used base ten blocks or dimes and pennies as a model, which worked well, and I highly recommend teaching this in a conceptual way when introducing it to students. 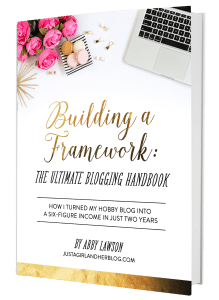 Today, however, I would like to share a trick that can help ease the frustration with subtraction, and actually remove the need to “borrow” altogether, and I hope you will find it helpful! Ok, so I’ll be honest, I’m really not a fan of teaching math “tricks.” Often, they are short cuts that only work under particular circumstances (which are not always made clear to students), and thus cause students confusion later. Some of these tricks were especially frustrating as a high school teacher, because in the midst of solving a complex algebra problem, my students would need to do some sort of computation with fractions, but could not remember the “trick” they learned, and would therefore solve the problem incorrectly. 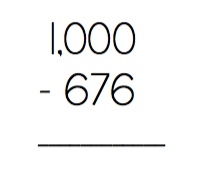 So just to be clear, this is not really a “trick,” per se, just an observation and mathematical truth that students can use to potentially make subtraction easier. To do this, however, they have to have a clear understanding of place value, and an understanding of subtraction and what it represents. Then they will be able to see that the problem will be easier, but the solution will be the same (therefore, solve the easier problem). For example, if you are given the problem 21-11, that is the same as 20-10. Or if you have the problem 47-17, that is equal to 40-10. Understanding why this is the case requires algebraic thinking, and will provide a good foundation for solving equations later on (i.e. 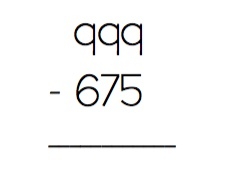 you can do any operation to one side of the equals sign as long as you do the same thing to the other side). If you are teaching this tip to your students, start with very simple problems like this, and model why this is true on a number line. 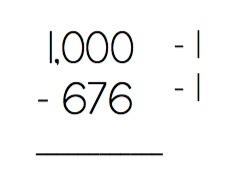 One way to think of subtraction is the distance between two numbers. So essentially, as an example, we’re saying that the distance between 240 and 228 is the same as the distance between 239 and 227. Therefore, I can subtract 239-227 to get the same answer. So why does this make subtraction easier? When you get to large numbers and problems that require borrowing (especially with zeros), this process can make things simpler with one small step: subtract 1 first. 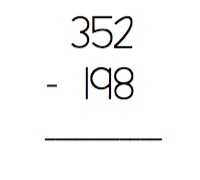 Now, when subtracting these numbers by hand, there is no borrowing or regrouping required. Obviously, subtraction problems that have lots of zeros will work best to simply subtract 1 from each number. If you’ve explained why this works, however, students can use this same logic to simplify any subtraction problem, and either make the regrouping less cumbersome, or remove the need to regroup altogether. Now, there is still some regrouping required, but it’s not as complicated. The basic goal of this is to create an easier problem and then solve it. 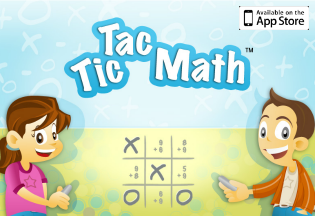 By making the numbers on top (or at least some of them) bigger, you can make the subtraction easier. 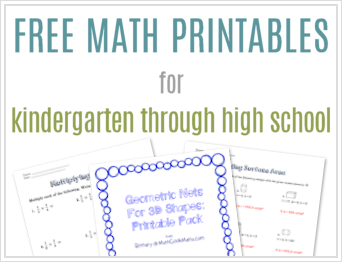 Not only will this help students increase their number sense and mental math skills, but it will help them to better understand subtraction, as well as build a foundation for later algebra learning. 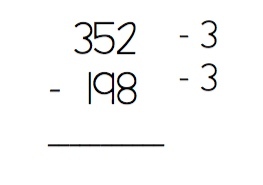 I would encourage you to start a discussion with your kids to see how they might explain this “trick” and why it works, as well as let them play with numbers to come up with their own way to simplify subtraction problems. As always, there is always more than one way to solve a math problem, and there will always be more than one way to simplify problems like these. So if your students try something different, check it for accuracy, and then encourage them to “prove” that it will work in all cases. And most of all, have fun playing with numbers! What are some helpful ways you have found to teach subtraction? 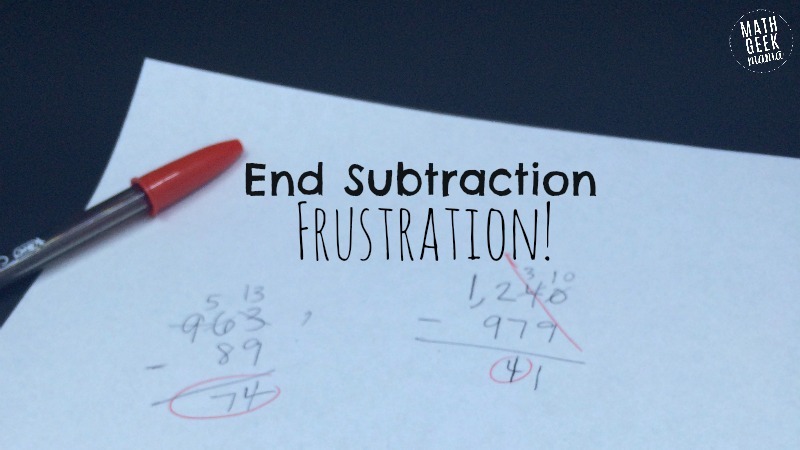 Do you have a trick to end the frustration with subtraction? Share it with us! Want more tips and encouragement for teaching kids to be confident problem solvers? Subscribe to my weekly email newsletter and get my ebook, Strategies for Problem Solving: Equip Kids to Solve Math Problems With Confidence, for FREE! I wish I’d known this one when I was in school – I hated that borrowing stuff! Thanks for sharing at the Thoughtful Spot! I love your commentary about not teaching tricks. I’m going to explore how to help fourth graders understand this strategy. It seems on par with how useful it is for student to use the strategy of doubling and halving in multiplication. I am a second grade teacher and we introduce 2 digit addition with subtraction. i am behind right now because my students struggled with two digit addition. I am looking for ways to better teach my kiddos as well as getting them there quicker. I agree with you Bethany. Nothing should be presented as a trick; there is always a solid reasoning behind every trick in mathematics. 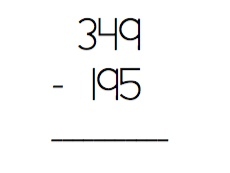 For the subtraction problem 352 – 198 , one could increase both numbers by 2 and have an easy subtraction, 354 – 200, that can be done mentally. This is not a trick. This is a strategy called “compensation”.